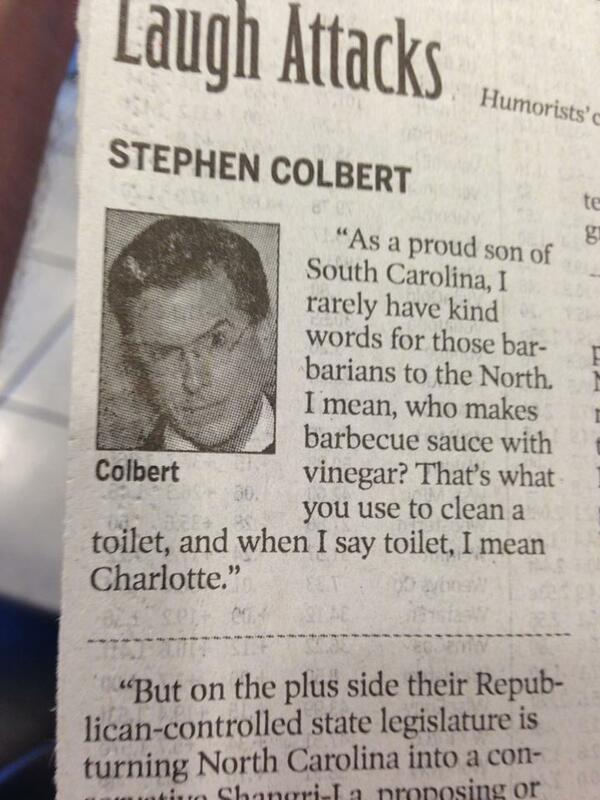 Poor representation of southern hospitality Mr Colbert. Sad. I just lost a lot of respect for this man. If you’re from NC then the respect won’t be missed. I’m from NC and who are you to tell me that I am not respected. You definitely don’t know the meaning of respect nor will you ever be respected with shallow and small minded thinking ike that. Go back to school or grow up and be a real SC man! The comedian was making a joke, in case you missed it. Jenn, stop embarrassing our state. Telling someone that to “go back to school“it when you don’t even understand what they said makes you look like a fool. But he insulted Charlotte, we must always have our ego stroked by everyone because we are better than everyone. You do realize Colbert’s “character” is a… Christ, never mind. Lmao. Via Jere Thomas on Facebook. Thoughts?